Help protect your business against spam, viruses, phishing, malware, ransomware, and other email-borne threats with collective threat intelligence from all Mail Assure customers. Email is the lifeblood of business communication. Unfortunately, email is also one of the most common vectors used to launch cyber attacks against businesses. SolarWinds® Mail Assure uses a sophisticated threat detection engine that is continuously updated based on input from its 2 million secured domains in over 85 countries. A suspicious email or attachment detected in one corner of the world updates the threat database, providing increased security for Mail Assure customers around the globe. Robust threat detection: Mail Assure’s threat engine uses statistical algorithms to process and analyze the results of SMTP behavior and reputation checks, content checks, user input from quarantine management, and many other filtering inputs. 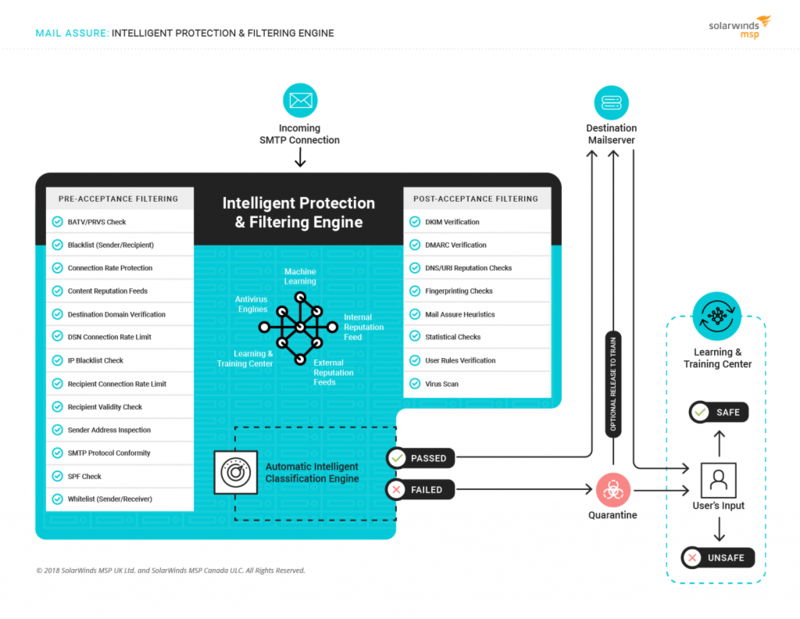 This provides updates to the threat engine, helping ensure you have the most up-to-date protection. Attachment blocking: Most harmful files are transmitted as attachments. To protect against this, Mail Assure administrators can set rules to block based on file extension. Fingerprinting: Mail Assure compares incoming messages against characteristics of known spam messages to identify spam, phishing, and other malicious emails. Advanced analysis: The technology assesses the authenticity of a message by analyzing the headers, message encoding, and formatting, and other characteristics of emails that users often don’t see, checking for clues about who sent the email and how. 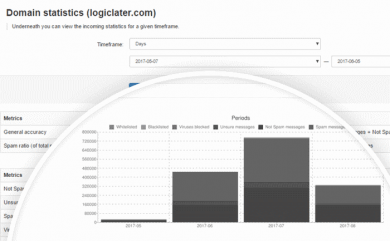 Real-time message source analysis: Mail Assure constantly checks the patterns and volume of email flow from the source mail servers to detect whether someone is actively spamming the organization. Abuse Management: Mail Assure includes full support for the Abuse Report Format (ARF – Standard IETF RFC 6650). Blacklisting/whitelisting: Add email addresses to your own blacklists or whitelists to block or admit messages from specific senders. Quarantining: Add email addresses to your own blacklists or whitelists to block or admit messages from specific senders. Secure, cloud-based email: All email is scanned remotely in the cloud, blocking spam and malicious attachments before they ever reach a business’s internal network. Continuously updated with threats detected by over 2 million secured domains in over 85 countries. 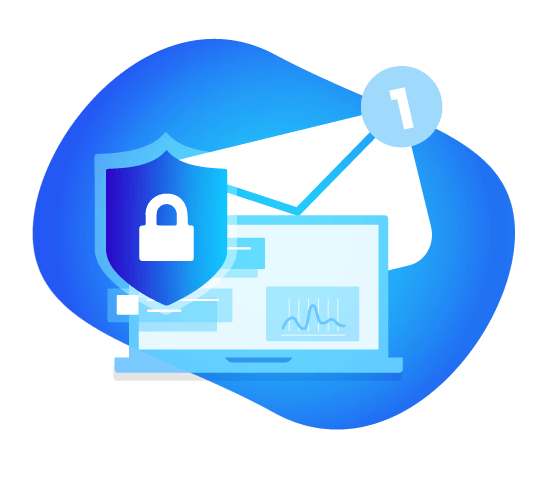 Mail Assure uses sophisticated threat detection methods to protect against malware, phishing, and other cyberthreats. We maintain a continuously updated Intelligent Protection & Filtering Engine that checks every incoming, outgoing, and internal email across over two million secure domains worldwide. A threat identified in one mailbox updates the detection algorithms for all other users in near real-time, providing incredible protection for your customers, no matter where they are or what email service they use. In today’s world, email is crucial for internal communications, customer service, and for generating new business. Businesses simply can’t afford lengthy outages. With Mail Assure, users can log in to a branded email portal, even if their core mail service fails, helping ensure uninterrupted productivity. Email archiving is good governance for all businesses. Mail Assure email archiving protects crucial information and intellectual property, and helps ensure availability and chain-of-custody in the event of a legal proceeding. All inbound and outbound email and attachments are compressed and encrypted to provide a cloud-based impenetrable vault. As businesses continue shifting IT to the cloud, Microsoft Office 365 is quickly becoming the standard for many businesses. However, because Office 365 is so prevalent, malicious actors frequently try to exploit it. Mail Assure provides a sophisticated layer of protection to bolster the native security in Office 365. Additionally, the Mail Assure web-based portal provides email continuity in the event of an outage or attack.